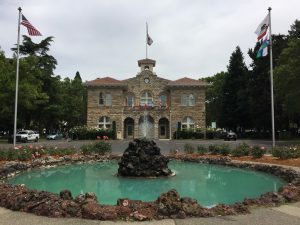 The Plaza is the "crown jewel" of Sonoma and has a key role in the town's history. The eight-acre Sonoma Plaza was laid out by General Mariano Vallejo in 1835, and is the largest plaza of its kind in California. On September 24, 1961 it was dedicated as a National Historic Landmark. Sonoma's City Hall is located in the center of The Plaza. Dedicated in 1908, the building was originally designed with four identical facades so that merchants from any side of the square could say the City Hall faced their businesses. With a duck pond, two playgrounds, the Grinstead Ampitheatre, a rose garden, and other amenities, the Plaza is a popular location for both locals and visitors. The seasonal Valley of the Moon Farmers Market as well as many special events are held at the Plaza. Public restrooms are located on the ground floor of the Carnegie building, located in the Plaza at 453 First St. East, and are open daily until dusk. Consumption of alcoholic beverages is allowed in the Plaza park between 11:30 a.m. and sunset. Dogs are not allowed on the Plaza, even when on-leash (assistance dogs excepted). The Sonoma Valley Visitors Bureau provides information on dog-friendly locations in Sonoma. The City of Sonoma has a smoking ordinance that prohibits smoking or vaping in many areas, including all parks and other public spaces, as well as public events, restaurants and bars, and hotels. Thank you for your cooperation.